Several years ago while working at Heritage Elementary School in Ohio, Emily was modeling an interactive read aloud for teachers with Yangsook Choi’s beautiful picture book, The Name Jar, to an energetic group of first-grade readers. A couple of pages into the story, when the main character, Unhei, begins to share details of her culture, a wide-eyed first grader jumped to her feet in one fluid motion to announce with her hands waving in the air, “Hey! I’m Korean too!! !” Pride and excitement exploded from her tiny body. The teachers paused. In the meeting time afterward a thoughtful conversation bubbled amongst the teachers about the texts used in classrooms and the power one title can have in the making of a reader and, we’d argue, a world citizen. In one of our touchstone literacy professional texts, The Art of Teaching Reading, Lucy Calkins writes, “Teaching reading, then, begins with helping children to want the life of a reader and to envision that life for themselves.” (Heinemann, 2000) We have found that with the specific, purposeful selection of books to be shared as a classroom community students’ engagement rises exponentially and the teaching of reading becomes that much more enticing. They want that life when they hear it and see it~ don’t we all?? Whether it’s the life of a yogi after a weekend at Kripalu or that of a chef after the insane burger at Spotted Pig or world traveler after you stare up at the Burj al Arab in person. When we can connect with someone or someplace that holds meaning we carry that to our growing knowledge. We readily encourage teachers that we work alongside to carefully choose titles of texts that show the students sitting within each classroom’s walls. This is often a focus incorporated into June planning or beginning of the year work with schools. Whether it is through a picture book or short story or poem or novel, as teachers we hold the power to bring texts to life and to help readers get lost in the world of story. Our colleague and writing guru, Colleen Cruz, often talks about how plot-based writers of realistic fiction begin by imagining the books that they wished existed on the shelves of their libraries. What would yours be? What characteristics or setting or hobbies would guide you to see yourself? The choice of read aloud text should be a meaningful one! Late last spring at Port Salerno Elementary School in Stuart, Florida, several fourth grade boys who were identified as being intermediate level English language learners instantly straightened their posture and leaned into the story as Home At Last was read aloud to them. Susan Middleton Elya wrote this picture book about a girl named Ana who moves to the US with her family from México and while she and her father begin to learn English, her mother steadfastly refuses to accept their new “home” and new language. Several phrases in Spanish dot the text and these boys turned to loudly whisper to their neighbors on the rug what those phrases meant with their eyes sparkling before the embedded translations were read by the teacher. A character spoke the same native language they did! A character on the pages of a book being read to them by a teacher also spoke TWO languages! These same boys actively participated in the whole-class conversation and deepened the level of their thinking, the thinking of their peers, and really of all of the educators sitting in the room learning from these readers. We can do that. We can provide that. 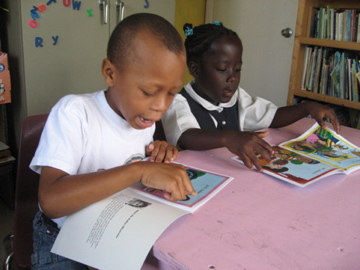 Emily sits on the Board of Directors for Exceptional Education Outreach (www.eeobahamas.org), a non-profit organization that provides literacy and special education support for schools in the Family Islands of The Bahamas. Before one of her trips south to present at a Ministry of Education workshop, she called Abe Barretto at Lee and Low Books (www.leeandlow.com). He’s our go-to-guy with all things related to multicultural literature and one of the kindest, most generous human beings we’ve ever met. A couple of days later, he showed up in the pouring rain during a lunch break at a school in Long Island City to deliver two massive manila envelopes. Books. Two copies of close to 30 titles, all of them representative of the children in the schools that EEO would be working with. Putting books that kids can identify with into their hands is a mission so many of us carry. We love you, Abe, for all that you do for kids, educators and the world community! These books don’t always have to show a specific language, but rather the language of a situation or place or sport. A reader Emily met last year was a voracious soccer player and the reader shared in a conference that she wished there were more books she could read with girls who played the sport she loved. A hazard of our lives as literacy consultants is the habit of finding the best independent booksellers around the country and amassing thick piles of books that tend to need to be shipped home as our suitcases on the first leg are usually bursting at the seams. In one of these magical shops, Happy Like Soccer appeared on a display and with the author’s name being Marybeth Boelts, author of another undeniable favorite, Those Shoes, it was an obvious one to grab and devour. A girl who lives with her aunt plays on a competitive soccer team outside of the neighborhood where she’s from… perfect! Add it to the bill. One hazy afternoon two summers ago, we overtook a large wooden table at Gabriela’s restaurant on the Upper West Side. The task ahead of us was clear: Pour over more than 200 Spanish titles of Bebop books to select titles to use in classrooms in Guadalajara, México. Half a jarra of sangria later and we were on a roll, quickly highlighting and sorting the mostly A-K (GR Level) texts. One title then the next. Yes. Yes. No. “How about this one, Huevos, Huevos, Huevos?” Enid innocently asked and a loud snicker erupted from the table of 3 twenty-something guys sitting next to us. We glanced at them and back at the books. Another sip of sangria and Emily responded, “Well, what do you think?” Neither of us registering the obvious eavesdropping these dudes were doing. “Well…” and Enid began to read a couple of pages. The phrase, Huevos, Huevos, Huevos, elicited a roar from our neighboring table each time she read it out loud and as oblivious girls on a mission it took us a while to register the source of hilarity. Then we blushed. Huevos, Huevos, Huevos is a text much more appropriate for a five year old Spanish speaker than a twenty-five year old Spanish speaker (especially a male). Another round in celebration of language in our lives! Language is Living.